More than 50 strikers rallied outside McGill’s James Administration Building on Wednesday night as NSA whistleblower Edward Snowden was set to speak. The picketers were pushing for better work conditions for temporary workers at the university while hundreds were lined up for Snowden’s talk. 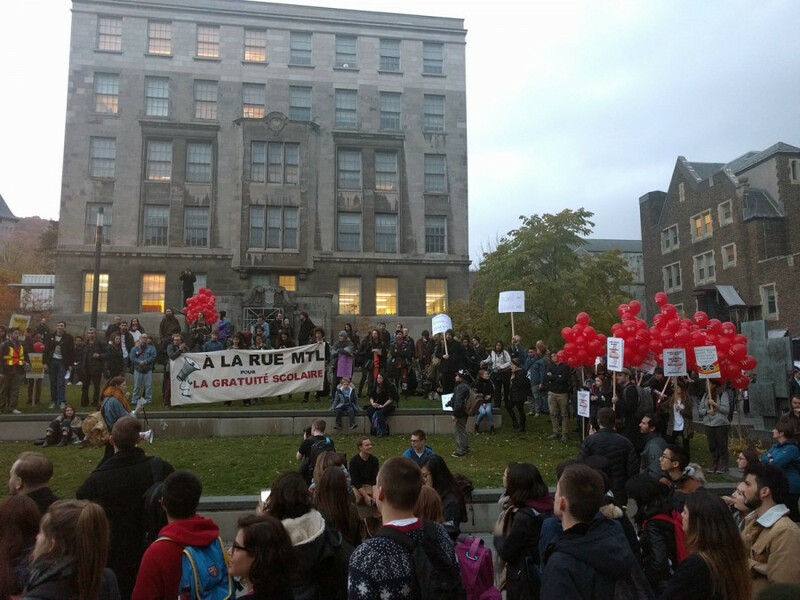 “This is McGill University; the time for change was yesterday,” said Claire Michela, president of the Association of McGill University Support Employees, a group that represents more than 1,500 casual, temporary and replacement workers on campus. Wednesday’s rally marked the fifth and final day of scheduled strikes organised by AMUSE in its push towards a new and improved collective agreement for McGill’s temporary workers. “We’re looking to bring our wages up to par with permanent employees—who do the exact same job—except we get paid half,” said Maxim Baru, communications and outreach officer for AMUSE. The association had negotiated with the university in its capacity as employer for the past year and a half without reaching an agreement, according to Baru, who had been contracted to work at the Snowden lecture that evening, but chose to strike instead. More than 1,000 people formed a line to see Snowdon that snaked from McGill’s Leacock lecture hall and along the front of the James Administration Building, where Baru and AMUSE supporters congregated. Thomas Chalmers, president of the McGill University Non-Academic Certified Association, a labour union that represents around 1,700 permanent non-academic staff, came to support the temporary workers. Thirteen years ago Chalmers worked as a temporary replacement in a role at the university where he earned at least $15 per hour. Even though Chalmers is currently a permanent employee at McGill, his reason to support the temporary workers’ strike was simple.